A versatile emcee and keen photographer, he is a former newspaper journalist who had his training in television production and presentation in Paris. An award-winning television personality, he is multi-lingual, and equally at ease in both French and English. Audio Visual Officer at the Embassy of France in Colombo for many years, he now runs his Public Relations and Media Consultancy Company - ‘Adahas’ – in addition to being a Corporate Etiquette Consultant. and “The Bonsoir Diaries”, he is also currently a member of the Executive Committee of the Alliance Française de KOTTE and a Founder Trustee of the ‘Lester James Peries and Sumitra Peries Foundation’. 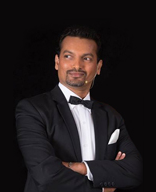 In October 2012, the Government of France conferred on Kumar de Silva, the title of ‘Chevalier dans l’Ordre des Arts et des Lettres’ (Chevalier in the Order of Arts and Letters) in recognition of his efforts to promote the French culture and language in Sri Lanka. This Order recognises eminent artistes, writers, and scholars for their efforts in promoting the awareness and enrichment of France’s cultural heritage throughout the world.